The deaths were real, yet the narrative was fake. Crisis actors portrayed as grieving students who were used to promote anti-conservative rhetoric and an anti-gun agenda are being publicly exposed. On February 14th, 2018, 17 people were killed in a high school shooting in Parkland, Florida. Nikolas Cruz, 19, was named by police as the gunman who launched the “devastating” attack on Marjory Stoneman Douglas High School. It was originally claimed that Nikolas Cruz was a white nationalist, but these claims were proven to be false and vastly incorrect. That was just another ploy to fit the mainstream media’s most wanted narrative of a Trump supporting white nationalist gunman. Seemingly, even with the incident still only hours old, media outlets were already trying to create their own political agenda, whilst parents mourned their dead children. As people grieved, the mainstream news networks called in their young group of crisis actors. What followed was the usual media protocol with notable left-wing media outlets such as CNN reporting a heavily biased commentary on the President of the United States and the second amendment. You guessed it. They’re going to try to make this Donald Trump’s fault. During the mass media coverage in the aftermath of the Florida shooting, real student survivors of the shooting were initially interviewed, but some of these videos have now mysteriously been disappearing from the Internet. However, the students that appeared the most on TV in recent days were very vocal and outspoken about the need to ban guns. There were were in fact, crisis actors reading from a script. This is of course still ongoing. If you turn on CNN today, you will see them pushing President Donald Trump and the National Rifle Association about the need to ban guns. Online commentators have now begun noticing that the same “students” were being used time and time again, with many actually recognising them from previous television appearances in other incidents. One of these students is David Hogg, who’s the son of an FBI agent, a Hillary Clinton supporter, and is a student activist against individual gun ownership. He was also featured six months prior to the shooting in an unrelated news story all the way over in California. In response to deny that he’s a crisis actor, he appeared on CNN again, a network that Hogg is no stranger to, which we will show more of later. “He can’t put that off on them. He is in charge of them and these people, what they love to do is push this off on bureaucracy and say it’s not them.” he added. Another heavily featured student, Emma Gonzalez, also offered praise for the FBI and criticized President Trump for his attacks on the bureau. “The fact that he wants to discredit them in any way, that he’s trying to shift our focus onto them, is not acceptable.” she said. Trump was of course right to criticise the FBI, who acknowledged their failure to follow protocols when it received a tip earlier this year about the 19-year-old shooter. Trump tweeted that it was “very sad” that the FBI missed signals sent out by the gunman. “Very sad that the FBI missed all of the many signals sent out by the Florida school shooter. This is not acceptable,” he tweeted. It should be of no coincidence that both David Hogg and Emma Gonzalez have featured heavily since the tragic attack. Both are in fact members of the same drama club – a fact that was verified and confirmed by Buzzfeed. “The group, who mostly know each other from the school’s theatre program, began their efforts in a scattered way in the chaotic aftermath of Wednesday’s horror” was a direct quote from a Buzzfeed journalist just days after the incident. It was confirmed on a national media platform that these students were in fact, theatre trained actors. Another similarity is that both Hogg and Gonzalez have very strong left leaning political views, focusing heavily on anti-Trump and anti-gun narratives during interviews with their left-leaning broadcasters. It has been reported that students who were pro-second amendment and supported the president were systematically blocked from any interviews or media appearances, which is the reason why the same group of students have been regularly appearing. It has also been noted by Twitter users that David Hogg appears to be reading from a teleprompter during some televised interviews, even having difficulty in keeping with the narrative and sticking to his lines. Numerous videos have also since surfaced online in which Hogg is shown to be rehearsing lines for a CNN interview with an earpiece during live on-air interviews. Lots of these videos are now also being censored or even removed from YouTube, because they are exposing these crisis actors and ruining the mainstream media’s propaganda, not to mention showing inconsistencies in the Parkland shooting overall. Other Twitter users however, were quick to fire back with one user urging critics and sceptics to block her “If you truly believe that my peers and I are crisis actors and did not actually experience the most traumatic moment in our lives, please unfollow and block me”. One of these sceptics was a Florida state representative who made his feelings known about these crisis actors and as a result, was suspiciously fired. 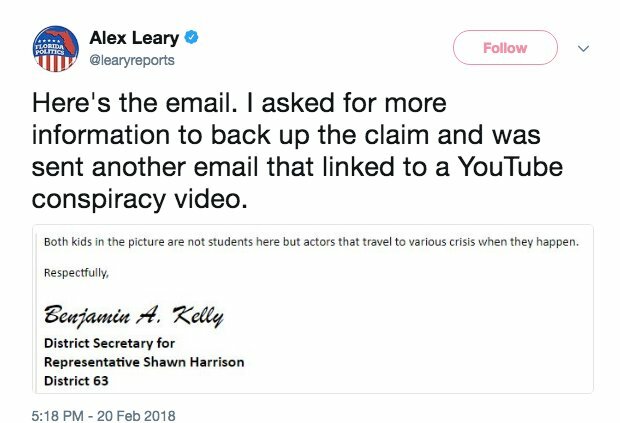 Benjamin Kelly, district secretary for Rep. Shawn Harrison, put his suspicions in an email to reporter Alex Leary for the Tampa Bay Times, highlighting that several students who appeared on television criticizing lawmakers on gun-control laws actually travel to different incidents when they happen. “Both kids in the picture are not students here but actors that travel to various crisis when they happen.” he told the reporter in a leaked email that surfaced online. Harrison said he was “appalled”, and fired Kelly after being made aware of the comments. Pictures have since emerged of both David Hogg and Emma Gonzalez, as well as a group of other students that have been used to promote anti-gun ownership views during televised interviews, smiling and laughing with one another in-between shoots, and after the Parkland shooting. Taking selfies and posing for photos with production team members at CNN before they go out and tell their heart wrenching stories on national television, doesn’t seem like the actions of grieving and distressed students, does it? Just imagine, only a few days prior, these supposed students had supposedly been involved in a deadly massacre in which they saw their friends and fellow students murdered in cold blood. When the narrative is as fake as the tears they cry, what is there left to believe from CNN and the mainstream news media?